I wasn't certain of anything anymore, except the New Orleans was a faithless friend and I wanted to leave her. The year is 1950 and Josie Moraine wants more than anything to leave her current life behind. Her mother, a brothel prostitute on Conti Street, pays little attention to Josie, and when she does, it's usually because she wants something from her. The gruff brothel madam, Willie Woodley, looks out for Josie, keeping (or getting) her out of trouble, and is more of a mother to her than her own. When Josie befriends Charlotte Gates, a wealthy girl who lives Uptown, she becomes even more convinced that she needs to leave New Orleans. It isn't long into their first meeting that Charlotte convinces Josie that her way out of New Orleans is to apply to Smith College in Massachusetts. Figuring out how to afford and get accepted to Smith becomes an obsession for Josie, one that she is willing to go to almost any length to accomplish. But the mysterious death of a wealthy man in the French Quarter soon causes Josie to become embroiled in a police investigation, brought upon by her own mother, which causes her to question her loyalty to all the people involved in her life. 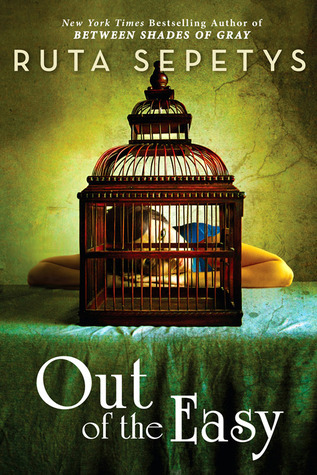 Out of the Easy is a brilliant sophomore effort by the author who brought us one of the most moving, important books written in the last ten years, Between Shades of Gray. And while nowhere near as moving as her first novel, Out of the Easy is just as compelling. Sepetys once again shows her prowess at throwing her readers into a story with a hook that reels them in and then keeps them turning the pages with meaningful, empathic characters and a riveting plot. And the fact that Sepetys can write a brothel madam whom readers can empathize with shows what a master she is at the craft of writing. I mean, hearing or reading the words "brothel madam" doesn't exactly conjure up the warm and fuzzies, ya know? But Sepetys still finds a way to get you on her side. Despite the fact that Out of the Easy is a drastically different book than Between Shades of Gray, don't let that steer you away from reading it. In fact, that should actually make it more appealing: it proves that Ruta Sepetys isn't just a one-trick pony and that she is a well-rounded author. And while Ruta may say that historical fiction is "the ugly girl at the dance" as she recently did in her speech at the ALAN conference (alluding to what a hard sell it is to young readers), I'm going to have to mix my metaphors here and say that Sepetys is that ugly girl's fairy godmother, getting her to dance with the handsome prince at the ball. This is definitely on my Most Anticipated list! I'm glad you enjoyed it, I hope it lives up to my expectations. I would have to disagree about historical fiction being the "ugly girl", it's one of my favorite genres! Great review! Taylor, I think adults tend to enjoy historical fiction more than kids. I think Ruta was alluding more to the fact that it's really hard to sell historical fiction to students. As a teacher of middle school, I know that first hand. Between Shades of Gray is one of the first historical fictions that students are reading on their own and passing around without my prodding. I have had this one for awhile and am thinking of reading it next. I LOVED Between Shades of Gray and it's one of my most recommended reads to people. It's such an important story. But I think this one will be great, I love the time period and setting! I cannot WAIT to read this one! Between Shades was one of my favorite reads last year, just brilliant.